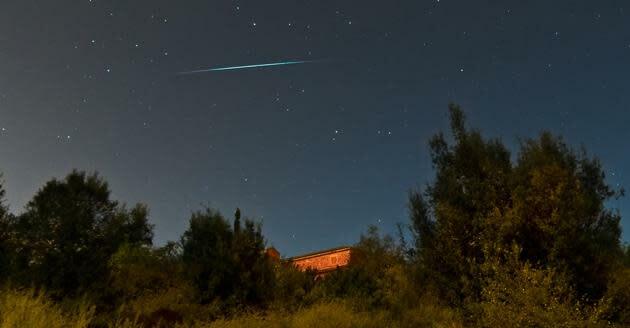 If you catch them at just the right time, a streaking meteor can be a stunning sight in the night sky. But when that meteor contains just a tiny bit of ice, a beautiful light show can turn into a violent explosion, as happened in the skies over Great Britain last night. The extraterrestrial explosion occurred just over South Wales in southwest Great Britain. The meteor rocked windows and set off car alarms, creating a sonic boom effect. Explained one witness, prior to the detonation "It had a heat trail behind, it was orange and white and very bright, and also seemed very close." No one was hurt. Why do meteors explode? Some are loaded with either ice or carbon dioxide, which can be trapped inside of the rock. As the gases boil and expand during entry into the Earth's atmosphere, meteors can explode in an epic display — with as much force as a hydrogen bomb. This article was written by Fox Van Allen and originally appeared on Tecca. Editor's Note: England/Great Britain references clarified.